This is plate 12 of Robert Melville Grindlay's 'Scenery, Costumes and Architecture chiefly on the Western Side of India'. Grindlay (1786-1877) was only 17 when he arrived in India in 1803. He served with the Bombay Native Infantry from 1804 to 1820 and during this period made a large collection of sketches and drawings. 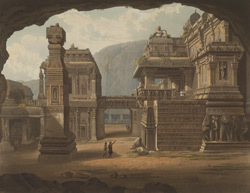 The Ellora is one of the most architecturally astonishing cave groupings in India. Dug side by side in the wall of a high basalt cliff, near Aurangabad in Maharashtra, the caves date from some time between the 6th and 8th centuries AD. Comprising 34 monastries and temples, Kailasanatha is the largest and most impressive of the rock-cut temples of Ellora. It was excavated in the 8th century and is dedicated to the Hindu god Shiva. The caves temples include the Buddhist, Jain and Hindu ornamentation.